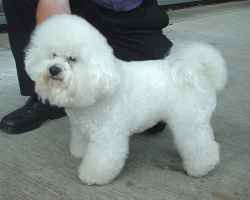 A Bichon Frisé (French, literally Curly lap dog) is a small dog that is the size of a large cat. They are popular pets, similar to poodles. They have a lot of energy and enjoy licking people, climbing on furniture, and chewing on things. They can be seriously, almost worshipfully devoted to their masters. Care must be taken to keep the face of a Bichon Frisé clean and trimmed, as eye discharge and mucus tend to accumulate in the fur that grows in front of their eyes, which can lead to serious problems.